Do you ever get tired of tomato sauce? I do. It’s so boring after a while; I mean there’s only so much you can do with it. I know, I know, there are people out there who are evangelical about their tomato sauce, but I’m just not one of them. I feel like pasta and tomato sauce should be a super easy dinner thing, and when I have to simmer it for hours, it’s not simple anymore. Even if I’m just reheating it and I simmered it for hours a long time ago. There are cream sauces, but they’re just too heavy, and I don’t understand vodka sauce… do you? It’s not my favorite. But pesto, I can get behind pesto! And, added bonus: it’s not just pasta sauce, it’s pizza sauce, toast spread, a sandwich condiment… the options are endless. Here’s the really good news: pesto isn’t just for basil anymore. You need a green of some sort–herb or vegetable–and a nut or seed. Add olive oil, garlic, lemon juice and salt and pepper, and you’re done! It’s that easy. It could be basil+pine nuts (traditional), cilantro+pumpkin seeds, kale+pecans, or spinach+walnuts. Possibilities for days. Ingredients: (recipe is adapted from shutterbean.com) Serves 2. First, you do need a food processor. Or an immersion blender. That’s the hardest thing about this recipe. 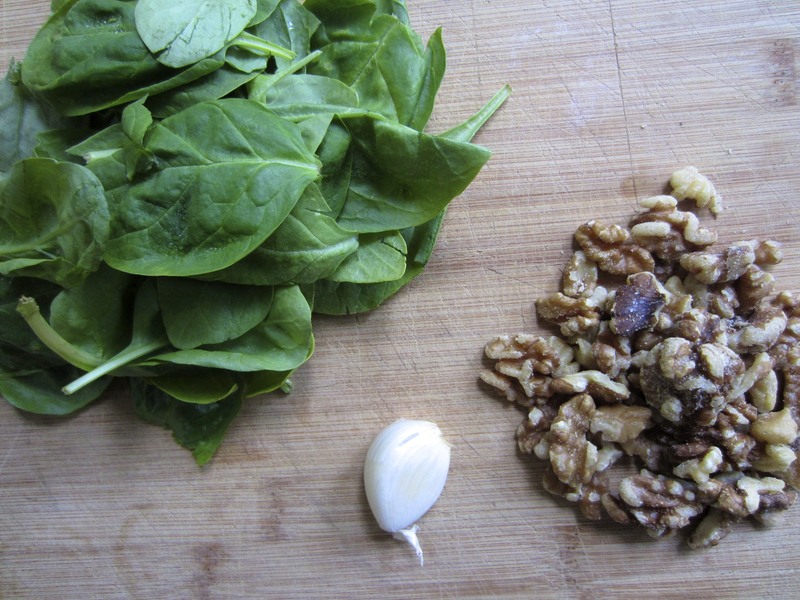 Put the walnuts, garlic (roughly chopped), salt and pepper, and spinach into the food processor. Pulse the blade a few times, just to get things started. Then, pour in the lemon juice and some olive oil. (Don’t be weird about measuring, just wing it.) Turn the food processor on and let it go for a while. If it needs more liquid, put some more olive oil in. Process until it reaches the consistency you’re looking for. I feel like you know what you’re going for here. Toss your pesto with pasta, sprinkle on some parmesan cheese, and that’s the easiest dinner you’ll have this week. 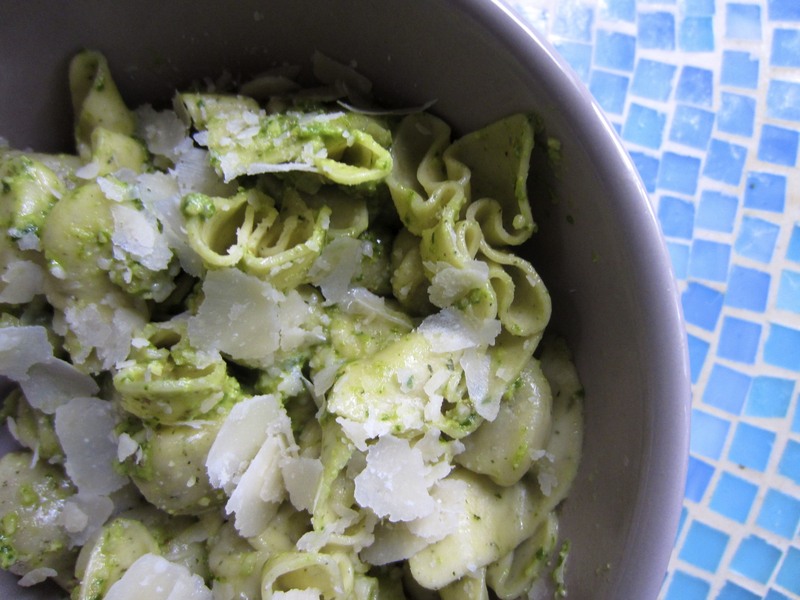 There’s really no need to heat the pesto, as long as your pasta is hot. Remember, you’ll use less pesto than you would pasta sauce. It’s like pasta salad. But warmer. Pesto will keep in a jar or tightly sealed tupperware container for up to a week and a half.